Are you interested in attending an accredited Christian university where you learn from caring and credentialed faculty in small, Ivy League-sized Honors seminars with intellectually curious classmates who have an average SAT of 1460? If you participated in Gifted and Talented programs in high school or if you are academically talented and serious about your studies and seek to be appropriately challenged, you should consider the academic enrichment of our Honors Program along with its merit-based scholarships. The Honors Program at Liberty is designed to help you achieve your highest intellectual and creative potential with supportive and credentialed Honors faculty. October 1, alumna Sara Heist spoke to over 100 new Honors students and shared her experience as a recipient of a Fulbright English Teaching Assistant grant. Sara graduated in December 2017, will be traveling to Brazil to teach English. “Five years ago I sat where you are sitting today,” she shared. "Today, I am preparing to go to Brazil to teach English to students who speak Portuguese. 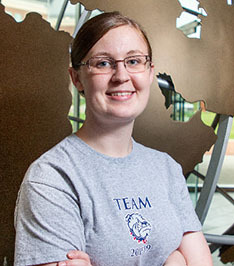 "I thought Fulbright was for engineers who could help prevent mudslides in Bolivia – and it is. But it is also for people like me. I thought Fulbright was for pre-med students who could research infectious disease in the Congo – and it is. But it is also for me. "God can use my teaching skills and language learning experience to connect with university students in Brazil. As I wait to be paired with a professor at a Brazilian university, I'm learning a third language: Portuguese. That was never part of my plan, but it was always part of God's.